Get your home party ready with hassle free LED Rope Light. Pre-programmed with 8 sequences, it's great for use in or outdoors and makes spectacular party lighting with very little effort. Perfect! 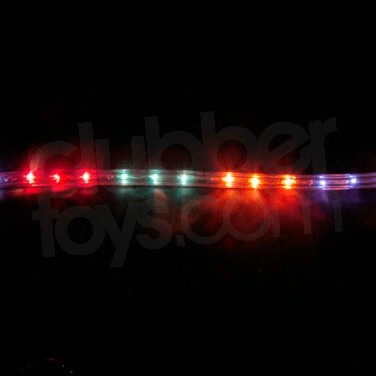 This ready assembled, LED rope lighting kit is available in various sizes and is ideal for fixed use or mobile DJ's, no complicated assembly required, just unroll it and plug it in for instant party lighting. With 8 pre-programmed sequences that can be controlled from the in-line controller included, it's great for discos or even safety lighting, ropelights will help mark out dancefloors or aisles and stairways. Suitable for use indoors or outside, this ropelight kit is highly versatile. 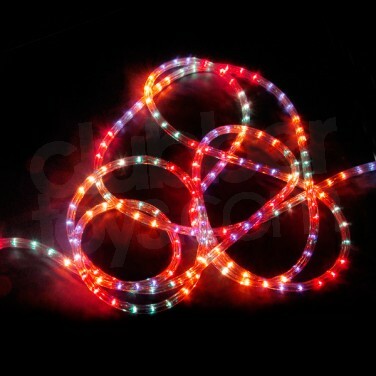 Using 360 LED bulbs instead of traditional bulbs, this rope lights kit is energy efficient, bright and very colourful. Distance from plug to controller box: 1.5m approx.